The Davy V. Blog: Rochester, NY Mayor Lovely Warren: Former RPD Chief James Sheppard "Heavy Handed, a Disservice to Our Community" So Why Did She Condone It? Rochester, NY Mayor Lovely Warren: Former RPD Chief James Sheppard "Heavy Handed, a Disservice to Our Community" So Why Did She Condone It? As Rochester, NY Police Chief, James Sheppard gave free range to rogue, corrupt cops who racially profiled, abused and violated citizens' civil rights. Rochester Police Chief James Sheppard was known for his heavy handed police tactics, with no regard for citizens' constitutional rights. In a 2012 press conference Chief Sheppard announced the Rochester, NY Police Department's "Zero Tolerance" policy. "If you're riding a bike and it doesn't have a bell, we're gonna stop you, if it doesn't have lights, we're gonna stop you." As Rochester, NY Police Chief, James Sheppard not only believed in racial profiling, he encouraged it. Chief Sheppard believed and supported stop and frisk. 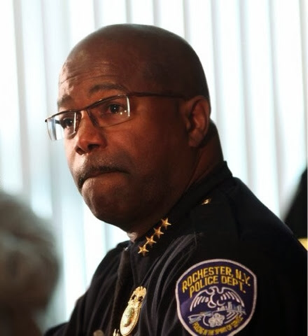 As Rochester Police Chief, James Sheppard lacked leadership. Check out the video below, of Rochester, NY Mayor Lovely Warren during a recent radio show interview, where she was asked how she would rate her former police chief. Mayor Warren says Chief Sheppard was "heavy handed" and was "a disservice to our community." Sheppard is one of three mayoral candidates who will run against Warren. What's interesting is that Rochester, NY Mayor Lovely Warren leaves out the fact that as Mayor, she was not only aware of Chief Sheppard's heavy handed police tactics, and complete disregard for citizens' civil rights, but she did nothing about it. Mayor Warren enabled Chief Sheppard.